What I like most about McLaughlin Vineyard is that it feels like it’s nestled away in the middle of the woods, which I suppose it somewhat actually is. The 15 acres of vineyard hosts two miles of an eleven mile trail system, which offers scenic hiking and is also a bald eagle sanctuary. Mid-December through Mid-March is eagle watching season. I did my tasting with Deedee, the tasting room manager, and she excitedly talked about having viewed a rare golden eagle, the first anyone can remember in the past 20 years. The vineyard offers a selection of four white, and three red ones. The highlights for me were the Blue Coyote, one of their estate wines which I found to be a very drinkable nice crisp and tangy, light and refreshing white wine. I also enjoyed their Red Fox Rose, I found it to have an enjoyable subtle sweetness too it, falling somewhere between what I would describe as sweet and dry. Dee called it a very versatile wine that paired well with grilled meats, as well as raw veggies and salad. I was pleasantly surprised to discover that McLaughlin also produces maple syrup from February to March, and recently expanded to being an apiary as well, producing fresh honey, the key ingredient in the meads they were to launch a couple of weeks after my visit. I’ve always been intrigued by mead, I mean the idea of fermented honey can’t help but cause me to want to make references to the nectar of the gods. Awesomely, they launched their mead along with a traveling Shakespearean company production of one of my favorite Shakespeare faursts, Much Ado About Nothing, which also gave name to one of the two new meads they’ve created – much ado about mead – and also a more traditional braggart mead, common to the era of the bard himself. Unfortunately, I had family visiting that weekend and missed out on the play and the mead. Hopefully, they will do it again sometime. I’m not sure if the meads are available for purchase yet, or even if they will be to buy on a regular basis. All in all I would suggest taking a whole day to visit McLaughlin Vineyards. Start off with a hike and maybe do a little bird watching if it’s the correct season. Move on to the tasting room for a very attentive and informative pouring; and whether you pack a picnic lunch to enjoy on their beautiful grounds along with your new favorite wine, or pick up some local foodie delights they offer in their country store you are sure to enjoy. I adopted it a bit, substituting my own spice mix in place of the Good season’s mix. Instead I added 3 cloves minced garlic, a Tbs. of onion powder, a pinch of both cumin and paprika, and salt and pepper to taste. 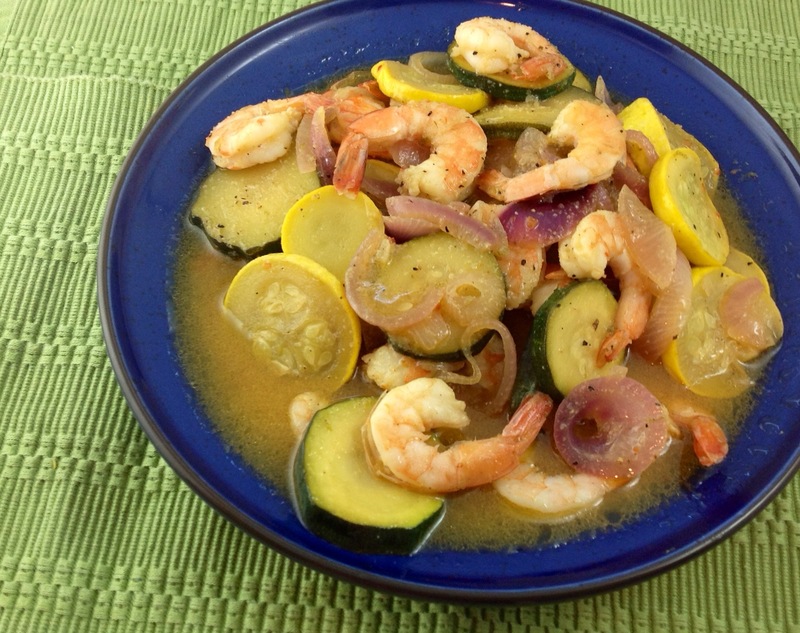 For veggies, I used summer squash and zucchini that I had on hand from a friend’s garden, and a red onion. I also marinated the shrimp and veggies separately for a few hours. Then I sautéed the shrimp and entire marinating mixture in a frying pan. While in a separate pan I sautéed the vegetables until they were slightly tender, and tossed everything together in a bowl to serve. As I mentioned in the previous post, Mike and I enjoyed it with a side dish of the cranberry bean dip, some pita chips, and of course, the Red Fox Rose. Last week some cranberry beans, also known as shelling beans or, gorlotti beans, or some other names depending on who you ask, showed up in our Bishop’s Orchard CSA share. 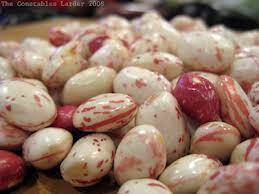 Whatever name you give them both the beans and the pods are light beige color that is mottled with a cranberry red streak. I thought they were very pretty to look at, but had no idea what to do with them. getables and serving them as a light summer side dish. Sounded good, but I wanted to make something I could store for later use and I wasn’t so sure how receptive Mike would be to eating what looks like speckled red lima beans. Actually, since I share the CSA with my parents there resemblance to lima beans, which my mom hates, led to her giving me too big bunches of them for just me and Mike. Being a lover of hummus and other squished bean dips I quickly found a few recipes for cranberry bean “hummus” (side note my sister likes to point out to me all the time that it is not technically hummus if chick peas are not involved, hence the quotations) and took elements from a couple of them to create my own cranberry bean dip. I was intrigued by one recipe that listed a spice called sumuc as one of the ingredients, but sadly several calls and visits to specialty markets left me empty handed and I was in too much of a rush to wait for it to come in by mail order. Though I did order some and plan on experimenting with it at some point. If anyone out there has ever used sumuc, I’d love to know what you did with it. My research made it seem like a very versatile spice that paired well with a number of things. 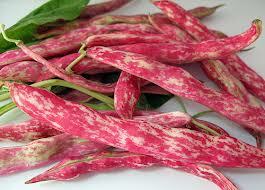 But back to the cranberry beans. I used the idea from one recipe of incorporating zucchini, which I also happened to have on hand from a neighbors garden and substituted cumin in place of the sumac. First, I put the shelled beans and roughly chopped onion in a pan and covered it with water. I brought that to a boil and then let it simmer for about 20 minutes. While that was going on, I sliced the zucchini in rounds, brushed them with olive oil on both sides, and sautéed them for a few minutes on each side until they were slightly browned. I strained the beans and onions and removed the zucchini from the pan and put it in the fridge to cool down while I zested my lemon and peeled my garlic. Then I put the cooked but now cooled beans, onions, and zucchini in my food processer; added the lemon zest and juice, tahini, olive oil and cumin, and processed it until it was smooth and creamy. I added salt and pepper to taste and pulsed it all a few more times. I served the CSA Smush with pita chips as an appetizer before a shrimp dish, which was a suggested wine paring during a recent visit to McLaughlin Vineyards. Check back tomorrow for the recipe and my review of the vineyard.